2000 Watt Living is now open at the Fabbrica del Vapore. With its focus on sustainable design issues at many scales and showing the research process, the exhibit has been excitedly received. Installation has begun for our exhibit in the Fabbrica del Vapore. Digeotruss is assembled and individual student projects are being installed. We're on schedule for our opening Tuesday. Check out our installation images on Flickr! Please also visit the other exhibitions sponsored by the School of the Art Insitute of Chicago in Milan: Objects for the Age of Obama at the Salone Satellite, and Danese Milano. The GFRY 09: 2000 Watt Living exhibition will be shown in Chicago from June 16-July 25 at SAIC's Sullivan Galleries (33 S. State Street, 7th Floor) during Making Modern, the inaugural degree show of thesis work by recent architecture, interior architecture, and designed objects students at the School. For press quality images and more information about the GFRY Studio and other design initiatives from the School of the Art Institute of Chicago, visit www.saic.edu/saicmade or contact Zak Boerger at zboerger@saic.edu or 312.629.6190 or Serina and Gita & Associates at serina@gitapr.com. The GFRY Studio 2009 is Cara Ellis, Tuan Nguyen, Bo Rodda, Tom Meeker, Jungwhan Chei, Taikkun Li, Matthew Stewart, John Kinstler, and Daniel Sommer with faculty support from Anders Nereim and Carl Ray Miller. The Active Light Cloud is an innovative approach to how we light the world of tomorrow. Using advanced computer vision that tracks any human movement against the basic static interior space, and inductively expands on that gesture to create an expanded field of pixel vectors, , the system is able to predict the user’s particular lighting needs. Users can throw light down a dark hallway or bring a cluster of task light with a single gesture. Most importantly it knows to turn off the lights once the room is empty, dramatically reducing energy consumption. The Active Light Cloud’s designer, Bo Rodda, is using a similar system to track the movements of a school of fish through a series of connected aquariums at the 2009 NeoCon conference this June in Chicago. 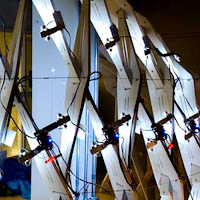 The functional prototype of Active Cloud Lighting was developed in collaboration with SAIC’s world renowned art and technology professors, most notably Matt Nelson, Systems Programmer, Ed Bennet, Electronic Systems Designer, Anna Yu, Systems Production Supervisor, and John Manning, System Executive Producer. The system’s programmed intelligence can be extended into a wide range of commercial and residential situations. Light switches might soon be replaced by a wide variety of gestures, controlling the affect and impact of our interior lighting in more intimate, fluid, intelligent, and environmentally conscious manner. 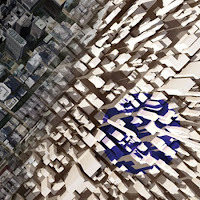 Today’s pursuit of sustainable architecture has sometimes pointed to extreme, curvy or irregular forms as a means to enhance building performance. Such structures require customized, non-homogenous components, and are often complex and costly to produce. The Digeotruss project proposes a middle ground between contemporary digital fabrication techniques and feasible construction. Inspired by Buckminster Fuller’s geodesic dome, the Digeotruss system uses geometry to achieve irregularly curved structures that are self-supporting and strong. 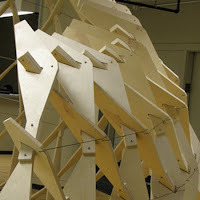 The GFRY kiosk is the first full-scale prototype of a Digeotruss structure. Constructed of planar birch plywood and steel tensioning cable, the kiosk requires no custom joints or angled cuts. It was fabricated in-house at SAIC and assembled by the GFRY team. Many large 20th century urban buildings have deep plans that preclude the easy interior distribution of natural lighting from the perimeter. This new ceiling system is made of a continuous flexible and reflective membrane, and it can be stretched and reconfigured to precisely reflect both natural light and low power LED lighting in ambient and task lighting configurations. Lumber processing, building construction, and building deconstruction leave behind cut off and trimmed pieces that are normally discarded because of their unusable shapes and dimensions. 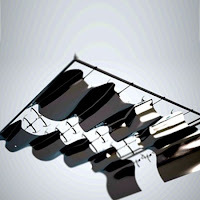 This new design system takes those cast off pieces and uses them to make precisely oriented sun shades – brise-soleils – for every possible facade orientation. 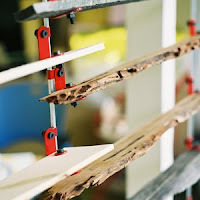 This new sustainable business model reduces the costs associated with building air conditioning by more than 20% and preserves the embodied energy of the wood. As part of the new business model, Matthew Stewart has written a new computer program that can analyze the shape and orientation of today’s most organic and fluidly-shaped buildings and quickly calculate the optimal brise-soleil angles for every facade and roof orientation. Tourists traditionally spin a multitude of prayer wheels in Tibet. Now that positive energy can be harvested along Tibetan streets, turned into electricity, and used to provide evening lighting along those streets and inside the adjacent homes. The prayer wheel generator is built on a base of used bicycle parts and a discarded surplus fan motor, making it ideal for use in the developing world. This invention supplements an inadequate and unreliable electrical grid with the power of electricity generated by tourism. By combining the low-cost efficiency and long life of 21st century LED lighting, with the simple 20th century efficiency of a bicycle, the Prayer Wheel Generator uses the best of high and low technologies. Densely packed tall buildings in today’s cities cast shadows over approximately two thirds of their own built surface, on average over different seasons and times of day. This pattern of darkness, inherited from the America’s 19th century gridded land and free-for-all zoning laws, does not allow for the efficient capture of the sun’s energy efficiently. The Urban Sun project investigates adjusting a city’s zoning envelope to maximize the area exposed to the sun, which can be used to generate local energy for the city. 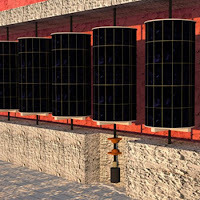 A simple computer program was developed for the Urban Sun project to scan any city form at any location on the earth and carve away the parts that send out or receive excessive shadows, revealing the most energy efficient form for that city to have when gathering energy from the sun falling on it. 2000 Watt Living will be exhibited at the Salone Internazionale del Mobile in Milan, Italy from April 24-30, and at Making Modern at the School of the Art Institute of Chicago from June 16 to July 25. The GFRY Studio is supported in part by a generous grant from the Motorola Foundation. Projects in the GFRY Design Studio attempt to develop the desire for more sustainable behavior, imagining an inspiring rhetoric through objects for new ways of living. New behaviors arrange themselves around these re-imagined lifestyles. The "2000 Watt Living" initiative imagines attractive new ways of using one sixth of the energy used by the average American. Aiming toward this goal, GFRY students have designed objects and urban systems that either reduce our energy consumption or generate their own electricity.